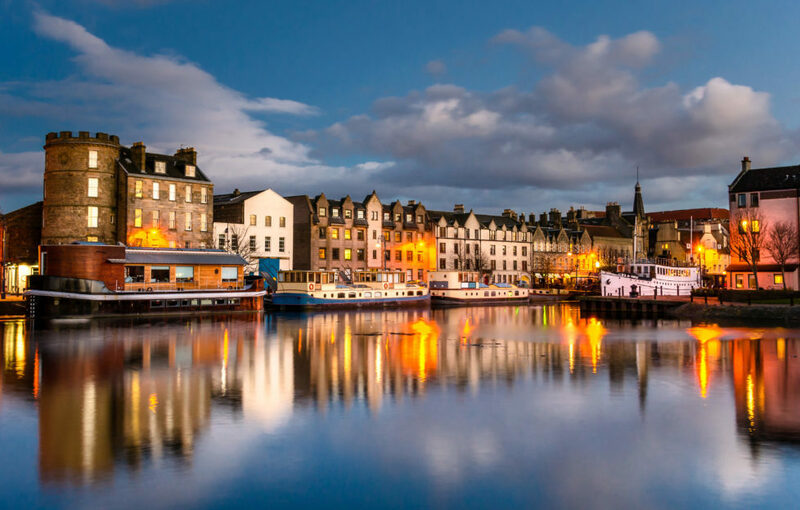 TimeOut have revealed their list of 50 Coolest Neighbourhoods in the World – and Leith was on it! From morning till night, you’ll find funky food and drink, laid back entertainment and a diverse bunch of friendly locals in Edinburgh’s slightly less frenetic neighbour. Brunch at Ostara is as colourful as it is delicious! Start the day with a stroll to work up an appetite for brunch. There are plenty of gorgeous cafes serving fresh produce, often sourced from small local suppliers and producers. Favourites include Ostara in Coburg Street for their divine Mushroom Baked Egg, Bramble Muesli and pancakes. Both Rocksalt Deli in Constitution Street and Café Truva on The Shore serve cracking Turkish breakfast as well as the Scottish version. The I Love Scotland breakfast bap from Printworks Café includes a very special bonus ingredient – tattie scone! Leith is renowned for its Michelin-starred chefs so, if you’re in the mood for a blow out, book The Kitchin in Commercial Quay or Martin Wishart on The Shore. Seafood lovers come from miles around to savour mussels and more at Fishers, The Ship On The Shore and The Shore. Yes, they’re all on The Shore by the Water of Leith! Go continental at Tapa (yes, tapas!) and Domenico‘s cosy Italian or munch a sourdough pizza at East Pizza, Commercial Street. Leith has a nice line in traditional pubs decked out in polished wood, brass and tiles. The Persevere on Easter Road is a favourite with football fans and the Central Bar at the foot of Leith Walk has pub rock bands on most Friday and Saturday evenings. If cocktails are your thing we can thoroughly recommend a scrummy Cardanomnom in the Lioness of Leith. Sunday afternoons often see jazz duos and trios take up residence in pubs all over Leith – with great meal deals and cut price drinks at the likes of Sofi’s Bar and Finn & Bear. The showstopping buildings of Edinburgh draw the crowds but connoisseurs of built environment will find plenty of interest in Leith. The Ocean Terminal complex was designed by Sir Terence Conran. Both Cables Wynd House and Linksview House are classic examples of post-war Brutalist architecture that have recently been listed Category A by Historic Environment Scotland. Cables Wynd House, known locally as ‘the Banana Flats’ due to the distinctive curve of the building, featured in the original Trainspotting movie. Stepping further back in time, A-listed Lamb’s House was reputedly first port of call for Mary, Queen of Scots,when she arrived in Scotland from France in 1561. Currently owned by conservation architects Groves-Raines, it’s a private home and office but invites the public in on Open doors Day in September. As soon as one quirky shop or café closes, another one opens in its place. This fluidity is one of the characteristics that makes Leith so vibrant and attractive. As a port, it also has a long history of diversity. Over the years, citizens from all over the world have arrived by boat and love it so much they stayed. Now they arrive by plane and help start new enterprises from Scandinavian bars to Sikh Temples. Recent additions include Casa Amiga, a Portugese café on Leith Walk, Crolla’s ice cream parlour on The Shore and carnivore’s delight, The Chop House on Constitution Street. What are your favourite Leith haunts? Let us know on Facebook, Twitter or Instagram.